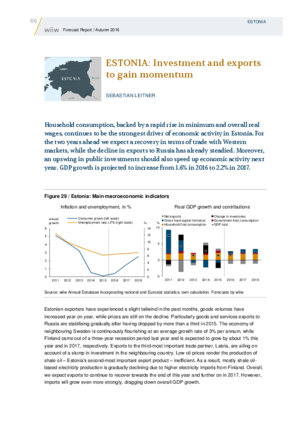 Household consumption, backed by a rapid rise in minimum and overall real wages, continues to be the strongest driver of economic activity in Estonia. For the two years ahead we expect a recovery in terms of trade with Western markets, while the decline in exports to Russia has already steadied. Moreover, an upswing in public investments should also speed up economic activity next year. GDP growth is projected to increase from 1.6% in 2016 to 2.2% in 2017.